From the sandy shores of Daytona Beach...to the dusty bull rings of the Carolina dirt tracks...on to the ultra fast superspeedways and television every Sunday afternoon. From legendary places like Langhorne and Lakewood to the modern facilities at Charlotte and Talladega -- You Are There! You follow Big Bill France's efforts to organize a rough and tumble sport -- an era when the names of Flock, Fireball, Thomas, Turner and Lee Petty were mighty forces. You watch as the sport progresses through the '50s and '60s -- as names like King Richard, Freddy Lorenzen, Junior Johnson, Bobby Allison, Cale Yarborough and Ned Jarrett rewrite the record books. And you ride along into the Modern Era with contestants who are polished professionals -- today's heroes like Dale Earnhardt, Mark Martin, Dale Jarrett, Darrell Waltrip, Jeff Gordon and Jeff Burton. Every driver who ever competed in big league stock car racing is within these pages. Every NASCAR Winston Cup Grand National race, through the 1993 season, is here. Hop in. Come along for the ride!! "The Beginning" traces the formative days of NASCAR when the competitors were an outlandish cast of characters with a sense for adventure. It was a circus of carefree performers who were neither stylized or synchronized, but the collection of odd balls at center stage commenced the theatre of NASCAR Winston Cup racing, which opened for a long run....Read why NASCAR did not originally want to sanction Darlington's inaugural Southern 500...And take a ride with Richard Petty as he drives in his first race. Buckle up for an exhilarating trip through "The Superspeedway Boom" -- a progressive era when big tracks were built in Daytona, Charlotte, Atlanta and California...Follow the tense moments when Curtis Turner and the Teamsters Union attempted to organize the drivers -- and how the powerful union was defeated by NASCAR's heirachy...Re-live the spirited duels between Junior Johnson and Fred Lorenzen in 1963 as the Ford and Chevy battle reached epic proportions...Experience Richard Petty's first big league win. Experience the turbulent years and the infamous boycotts of Chrysler (1965) and Ford (1966) with General Motors on the sidelines...Share the joy as Curtis Turner makes a triumphant return at Rockingham after four years in exile...Witness the crowning of the "King of Stock Car Racing" when Richard Petty wins an incredible 10 NASCAR races in a row...Here's your ticket into the restricted NASCAR garage area and learn why the drivers boycotted the inaugural Talladega 500 in 1969. Feel the thunder as Bobby Allison and Richard Petty engaged in their famous fued in the fall of 1972...Be ushered into victory lane with David Pearson as he wins 11 of 18 starts in 1973...Enjoy your top row seat as newcomers Darrell Waltrip and Dale Earnhardt reel off multiple NASCAR Winston Cup championships...Share the thrill of Richard Petty's 200th career win before the President...Ride with Bill Elliott as he captures the Winston Million in 1985 by winning a record 11 superspeedway races. The first supplement to the "Forty Years of Stock Car Racing" series details the years 1990-1993....Relive all the excitement and drama of the progressive years of NASCAR....from Dale Earnhardt's dominance to Alan Kulwicki's upset of ages in the 1992 Winston Cup championship chase.....And feel the loss of beloved heroes Kulwicki, Davey Allison and J.D. McDuffie. A deluxe Hardbound edition that features the Real Racers from NASCAR's most dynamic and exciting era. These hard-boiled speed mechants were wild characters with charming charisma. Their entertaining exploits of speed have been captured within these pages. A classic collection of photographs and entertaining stories grace this book......Authentic NASCAR Winston Cup records which will likely live forever are documented......A special colorful chapter featuring the fabulous winged Plymouth SuperBirds and Dodge Daytonas......a detailed account of the 1948 NASCAR season with results and nostalgic photographs. Now residing in Surfside Beach, S.C., Charlotte, N.C. native Greg Fielden is regarded as one of the premier historians of NASCAR stock car racing. He has spent his entire adulthood documenting the early years of America's most exciting sport. 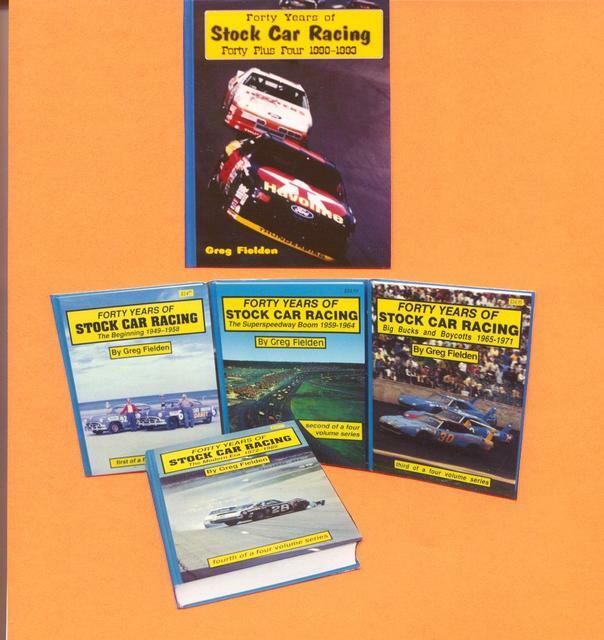 The Forty Years of Stock Car Racing Series of hardcover books is truly an enlightening, entertaining and informative trip through NASCAR's glorious history. Researched and written by noted racing historian Greg Fielden, the entire series of books covers every single NASCAR Winston Cup Grand National race from 1949-1993. The complete set consists of nearly 2,000 pages and over 2,200 photographs. It is simply the best reference books available on the major league NASCAR circuit. Each chapter and year begins with an interesting overview of the season. The book then proceeds into a race-by-race account and a separate report for each event. A "box score", detailing each driver, team owner, make of car, lap leaders and money won, accompanies each report. Re-live the races you have attended, or wished you had!